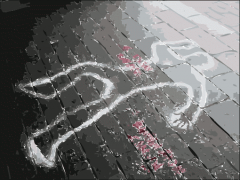 Honors College Blog » We’re looking for MURDER MOST FOUL!!! We’re looking for MURDER MOST FOUL!!! Are you interested in investigating a MURDER? Have you always wanted to plan “the perfect crime?” Would you rather read a Sherlock Holmes mystery than your assigned textbook? Submit a script for this year’s Honors College Murder Mystery Dinner! The Honors College is now taking submissions for the script for this year’s Murder Mystery! We’re looking for a script with 9 to 11 characters (though they don’t all have to be suspects), about 35-40 minutes in total length, but with breaks between scenes for different courses of a meal to be served. For this competition, we’d like you to give us 3-4 scenes of your script which introduce most of your characters, and give us an idea of your writing style. You should also include a short summary of your plot (but WITHOUT GIVING AWAY THE ENDING in either the scenes or the summary!) The winning writer will be paid $250 for a complete script, which will be performed at this year’s Murder Mystery Dinner. All entries must be received in the Honors Office by FRIDAY, OCTOBER 30th! If you have any questions, or if you’d like more information on the nature of our previous Murder Mystery scripts, please contact Bethany at bethany.scroggins@acu.edu. Happy sleuthing!